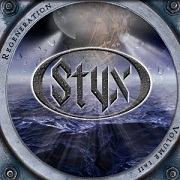 Review: "Styx: Regeneration Volume I & II" - Sea of Tranquility - The Web Destination for Progressive Music! Re-recording old hits seems to be a trend these days for classic rock bands, and here is Styx joining the party with their new Eagle Rock release Regeneration Volume I & II, a 2CD set of brand new versions of many of the top songs in their catalog done by the current incarnation of the band. Of course, this line-up of Styx has now been together for some time, and comprised of Tommy Shaw (guitar, vocals, mandolin), James Young (guitars, vocals), Lawrence Gowan (vocals, keyboards), Todd Sucherman (drums), and both Ricky Phillips & Chuck Panozzo on bass (Chuck plays with the band on a part time basis). You get some expected as well as unexpected classics here from the Styx cannon. Tunes such as "The Grand Illusion", "Fooling Yourself (The Angry Young Man)", "Come Sail Away", "Renegade", "Blue Collar Man", and "Crystal Ball" are all songs that any Styx collection would not be complete without, and the band do a great job with note for note reproductions of these staples. Tommy Shaw still sings as great as he did 30 years ago, which you can plainly hear on "Sing For the Day", and Gowan does his fantastic Dennis De Young impression throughout, so many of these tunes don't sound too much different from their original studio counterparts, except with 2011 production values. Nice to hear cuts like "Lorelei" and the hard rocking "Queen of Spades" and "Snowblind", as well as the folky "Boat on the River". 'JY' also proves that he can still rock out quite hard on his blistering track "Miss America", and the band even throw in a new tune here called "Difference In the World", a more acoustic based number with some great melodies and rich vocal harmonies, with Shaw especially sounding amazing. As an interesting bonus, the band decided to do updated versions of two Damn Yankees hits (the band Shaw was in with Jack Blades & Ted Nugent back in the early 90's), the rocking "Coming of Age" and "High Enough". Both are executed quite well, and it was fun to hear them again after all these years in the 'Styx way'. Depending on your take of the whole 're-recording of old songs' trend, this will no doubt effect whether you want to take the plunge on Regeneration Volume I & II. In my view, this is a fun CD, a brand new 'hits collection' if you will, with a few surprises and bonus cuts thrown in for good measure. For the die hard Styx fan it's a no brainer. This is for the new Styx regurge issues as fans are calling them. Many reviews on Amazon and even on styxs facebook page. Also check out melodicrock forums for more. This doesn't sound like a multiplatnium band neither does the albums. Jy's vocals are over the place. Lawrence Gowan is NOT no Dennis Deyoung.